After starting our trip from Istanbul, we have finally made our way into the largest and capital city of Greece, Athens! 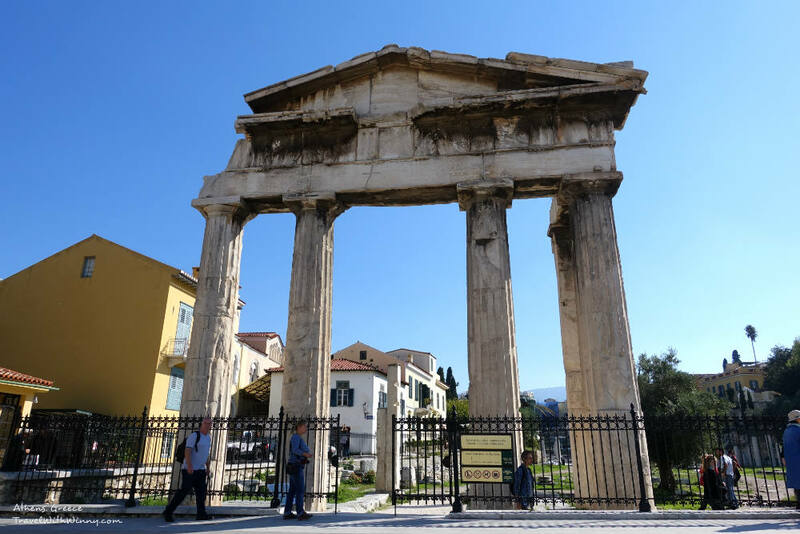 Athens is the birthplace of democracy and the city where Classical Greece began! It is the center for arts, learning and philosophy for centuries and has thousands of years worth of history. Below are some tips on how to travel Athens on a budget for 3 days. This is the view of Athens from the Acropolis. 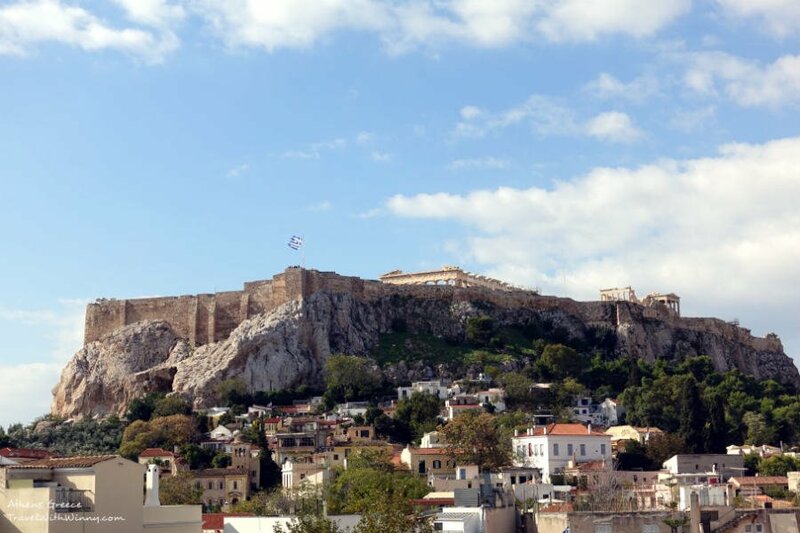 If you are visiting Athens for the first time, the most appropriate place to stay is near the Acropolis as most of the important attractions are close to this area. 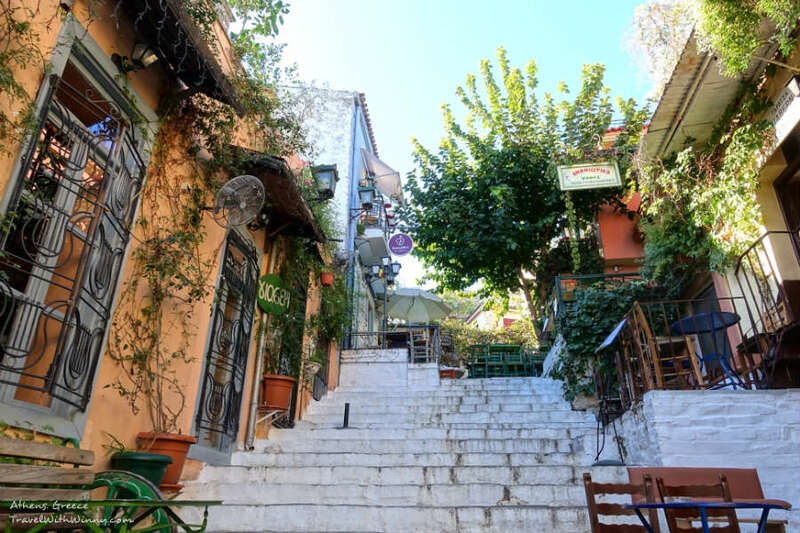 Accommodations should be based in either Plaka, Monastiraki or Thissio districts as these are at the base of the Acropolis. There are Roman ruins are everywhere around these districts and you will never run out of shops and restaurants to go to around. The hotel we stayed in was called “Central Athens Hotel” in Plakas near Acropolis. The economy double/ twin rooms with private bathroom can be as low as € 70 including free Wi-Fi and breakfast! Upon check-in, the 24 hour receptionist hands you over a map of Athens and were very helpful. A normal double room inside Central Athens Hotel. Although it wasn’t big, but it was clean. The breakfast had a good selection of hot and cold food. It is non-comparable to Hilton, however, given the price we paid, it was sufficient as there were good Greek desserts and breads on offer. I have the theory that if you eat enough at complimentary breakfast buffets, you could save on lunch and just spend money on dinner! The room with the Acropolis view from 4 th floor. The roof-top bar at this hotel has an amazing view of the Acropolis, however it didn’t serve much food. We ended up visiting a nearby hotel for a dinner with the Acropolis view. 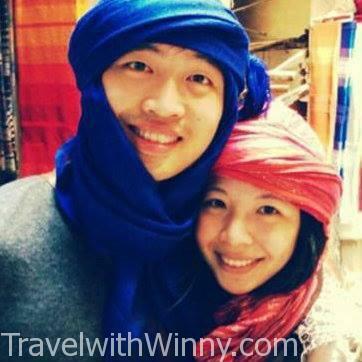 During our stay we didn’t spend money on transport as we were within walking distance to all the attractions. The only transport cost we spent in Athens was the taxi from Piraeus Port to Plakas (€20 fix price) and from Plakas to the airport (€38 fix price). 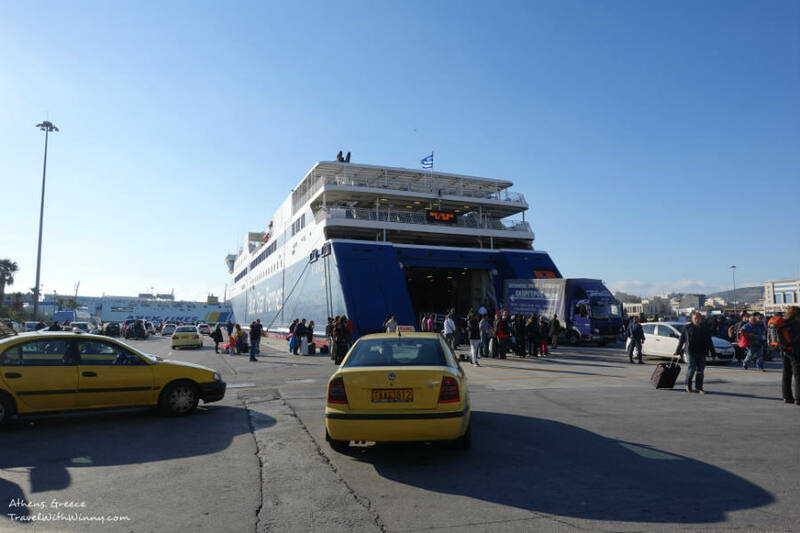 Our Blue Star Ferry arriving at Piraeus Port from Paros. The standard metro fare to the airport is €8 per person, €14 for 2 people and €20 for 3 people. It is amazing that they have discounts for people travelling in groups and is perfect for a group of friends travelling around Athens on a budget. A 24 hour ticket is €4 per person except to the airport. Acropolis, the ancient high city of Athens is a “must see”. 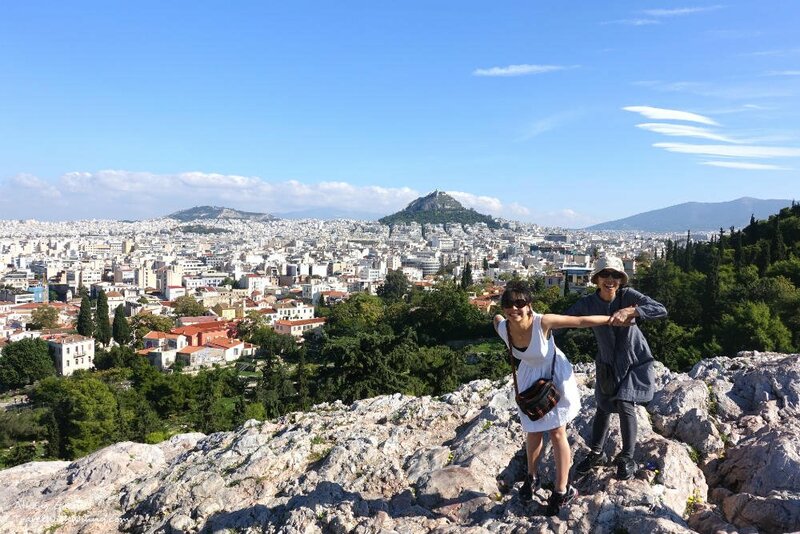 It is located on a huge flat-topped rock that’s 150 meters above sea level, overlooking the modern city of Athens. The surface area of the Acropolis is a massive 3 hectares in total! 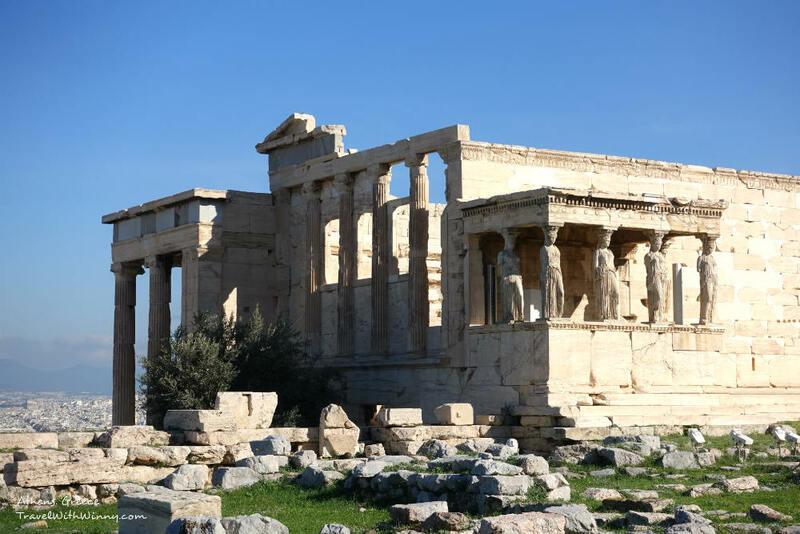 There are many ancient buildings within the Acropolis with the most famous one being the Parthenon. 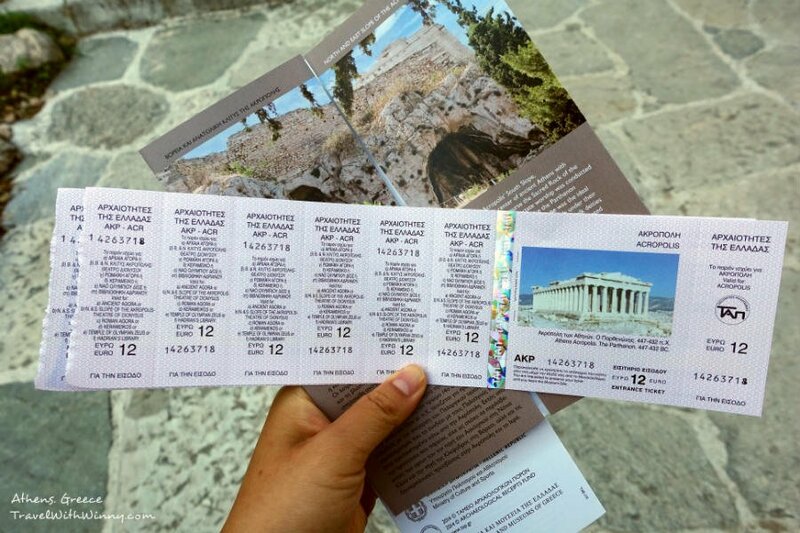 Our tickets to Acropolis and other ancient ruins for the next 4 days. The entrance fee for the Acropolis is €12 including 6 other archaeological sites around the area (10 in total for you to choose from), valid for 4 days from the purchase date. It is enough to keep you occupied for at least 2 days. Otherwise each individual archaeological site is €2 to enter. You can only use the ticket once at each area. Do check the official website as it has free admission days. Children under 18 are free as well. That’s pretty much the only money we spent on sight-seeing in Athens other than the New Acropolis Museum which is €5 per person. 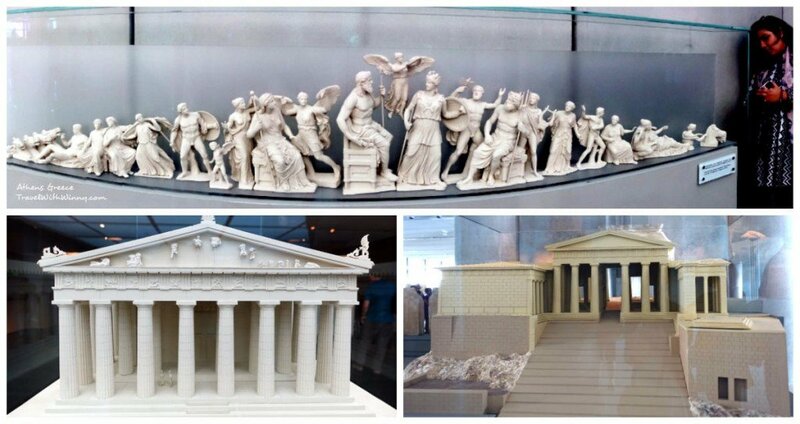 Visiting the New Acropolis Museum will definitely make you appreciate Acropolis a lot more. After the Greece financial crisis, prices at the Acropolis in Athens will rise from €12 to €20 starting from April 2016. A little bit of bad news for people travelling to Athens next year. The ticket into the Acropolis can be purchased at the site. It opens at 8.00am every day and is best to visit in the morning to avoid the summer heat and crowds. 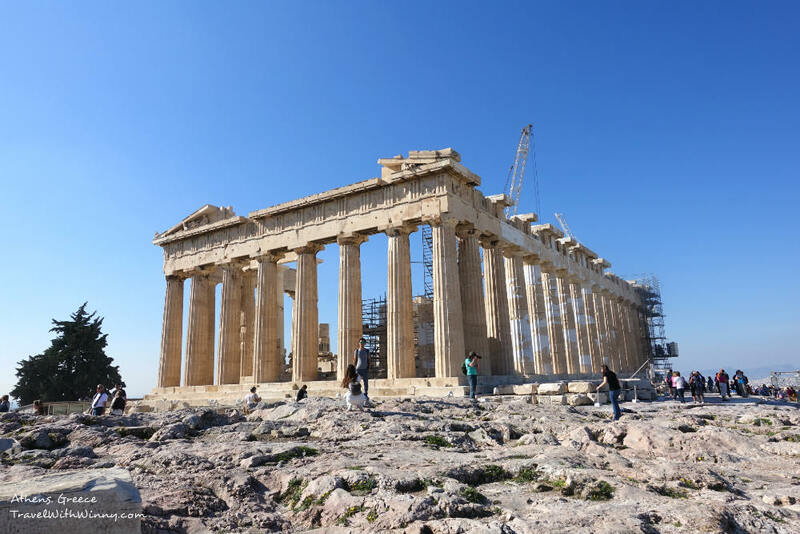 There are 14 major archaeological remains within Acropolis of Athens and most are under restoration. 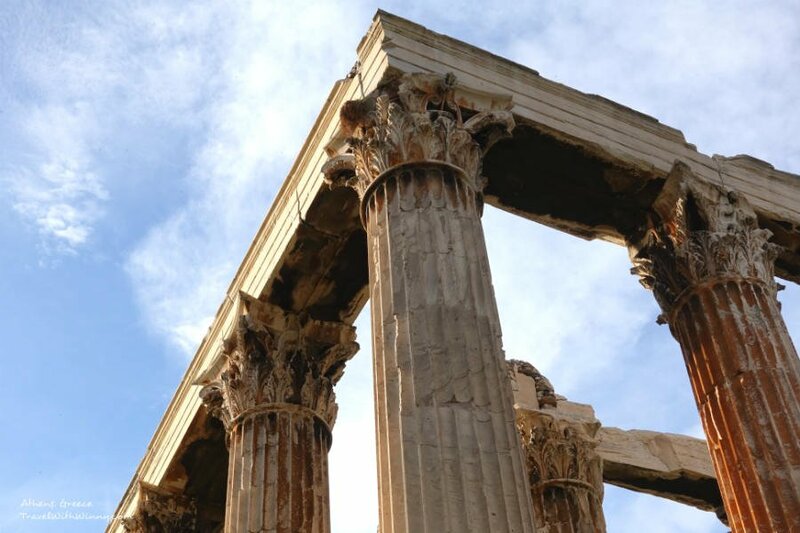 Despite touring Athens on a budget, Acropolis is a must-see! Our visit to the Acropolis wasn’t as pleasant as the one we had in Ephesus, Turkey. There were so much restoration going on and fencing was all around the archaeological areas. It was hard to enjoy the grand architecture. The restored “white parts” on the pillars are actual marbles quarried from the original marble mines. Restoration of this place has already cost over 100 million dollars. 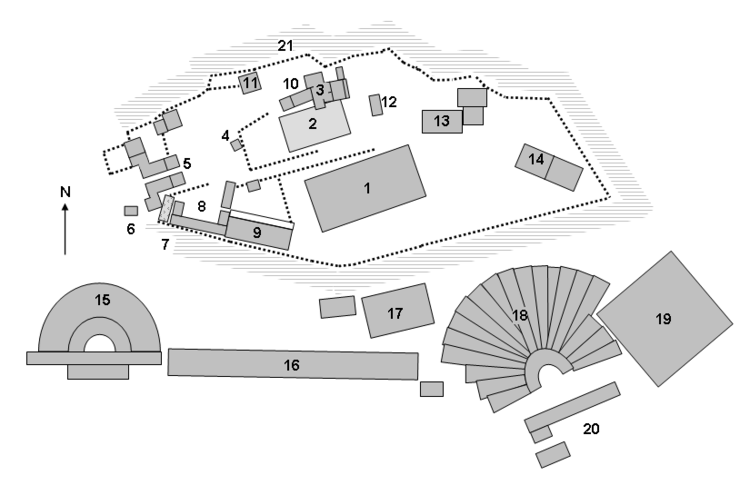 Site plan of the Acropolis at Athens showing the major archaeological remains from Wikipedia. The Parthenon: The largest temple on Acropolis. 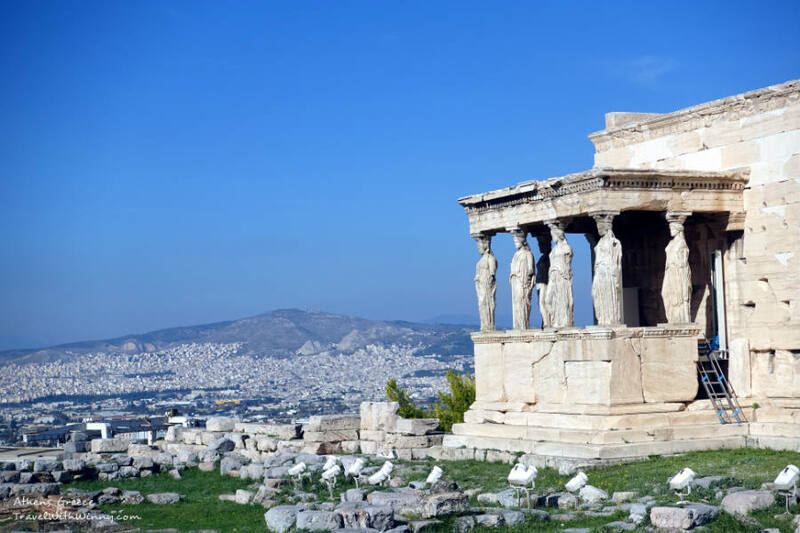 Built between 447BC to 438BC, it was dedicated to Athena (goddess of the city). It is hard to imagine that this grand structure only took the Athenians 9 years to construct. One of the most interesting fact about the Parthenon is that it has been converted to a church after 5th century AD and later a mosque under Turkish rule. The Parthenon was a slight let-down with all the constructions going on. Erechtheion: A temple on the northern side of Acropolis dedicated to both Athena and Poseidon. Legend stated that Athena and Poseidon fought over the possession of the city and in the end, Athena won. However Athenians constructed a temple for each God to maintain the balance. Erechtheion: The temple dedicated to Athena and Poseidon. There were once six Caryatids on the east porch. One of these statues was removed by a Scottish lord, Elgin, in 1801 to decorate his mansion. This statue was later sold to British Museum and the other five are now in New Acropolis Museum. The ones on the Acropolis are replicas. These Caryatids on Erechtheion are actually replicas. Real ones are in New Acropolis Museum. 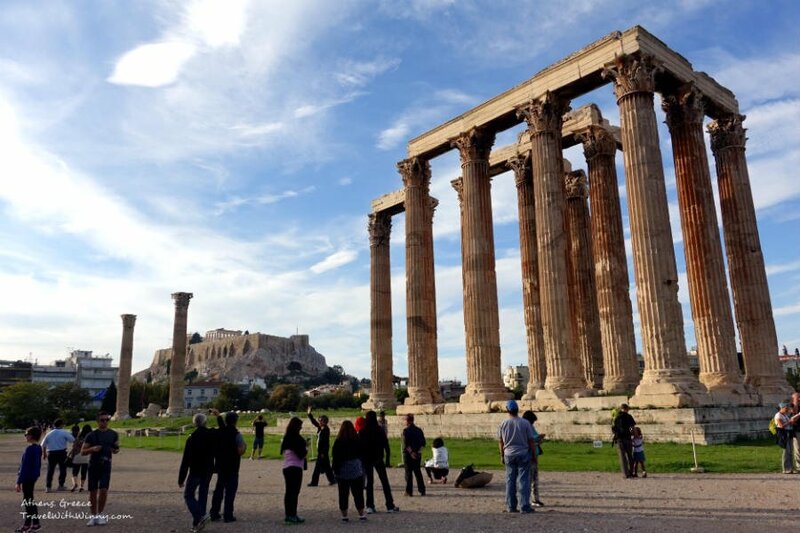 The Temple of Olympian Zeus is my favorite site in Athens. It is included in the ticket to Acropolis. It was one of the biggest temple during the ancient Greek and Roman periods. Because there were a lot less people, Olympieion was quieter than the Acropolis and was easier to enjoy and appreciate the place. My favourite site in Athens: Temple of Olympian Zeus. The construction of Olympieion began 6th century BC and completed 600 years later during 2nd century AD. The temple’s glory was short-lived, it was never repaired after it’s destruction in 3rd century AD during barbarian invasions. 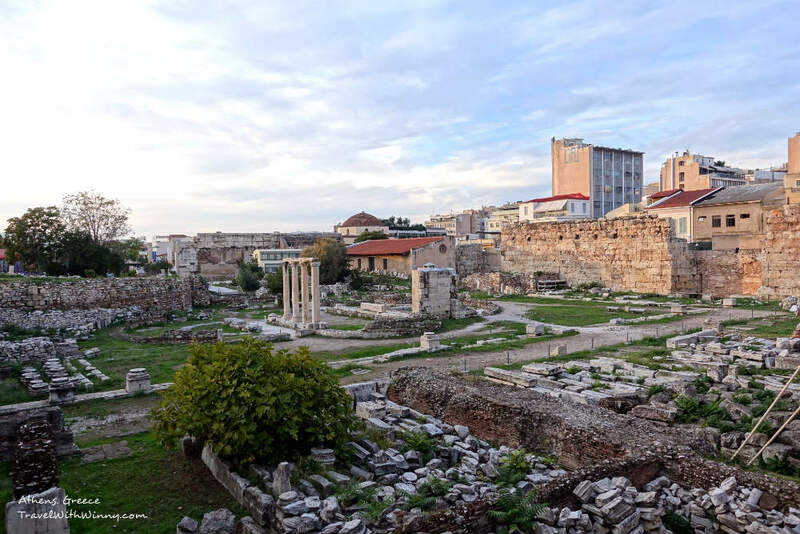 The temple ruins was then quarried by medieval Athenians to provide building materials. Out of the original 104 columns, only 21 were still standing by 1436. Today, only 15 columns remain standing after 6 columns fell during a storm in 1852. Nothing else left. 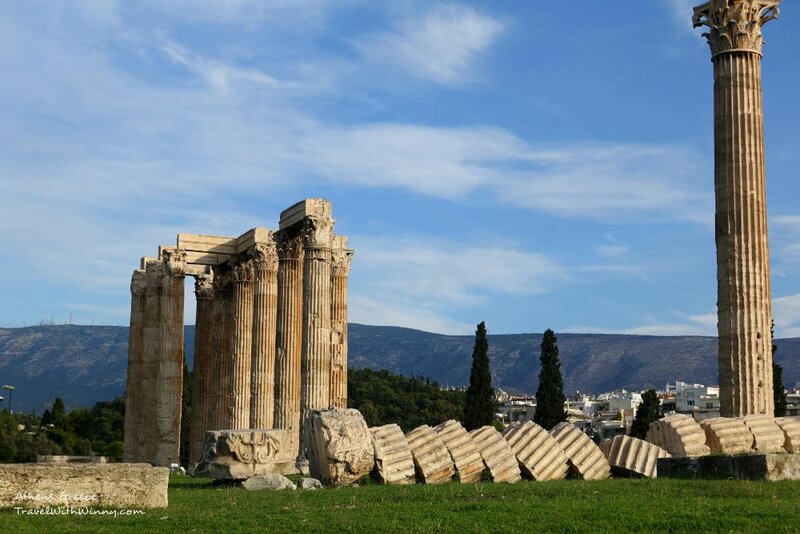 The columns from Temple of Olympian Zeus on the ground in pieces. I still love this temple no matter what! I think I grew up with Greek mythologies and Zeus has always been the king of the Olympian gods. I was quite touched to be able to stand next to the temple dedicated to him. Don’t forget to look up and admire the details. The Ancient Agora of Athens is located on the south-west of the Acropolis. This is where all the politics, social activities happen until 267AD. In 1859, the archaeological excavations began and they had to demolish about 400 buildings covering around 12 hectares to uncover the site! The whole place feels more like a park than an archaeological site. Ancient Agora of Athens during sunset. There are many buildings and structures within the agora. 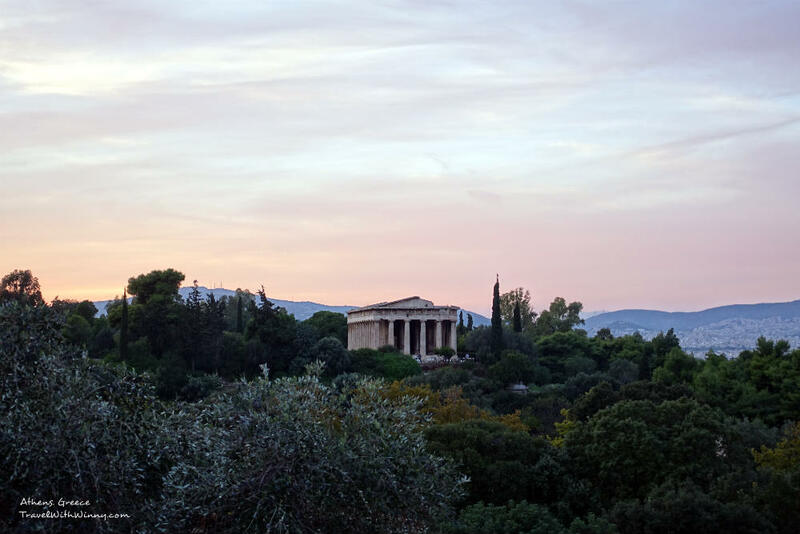 One of the most famous ones being “Temple of Hephaestus” that sits on top of Agoraios Kolonos hill. It was served as Greek Orthodox church from 7th century till 1834. The temple lights up beautifully at night. Museum of the Ancient Agora was a great open-air museum. 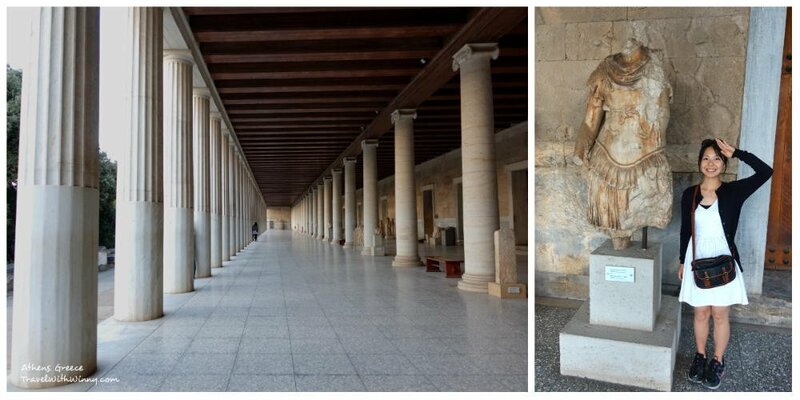 Museum of the Ancient Agora is situated on the upper level of Stoa of Attalos (probably the most prominent structure within the agora). 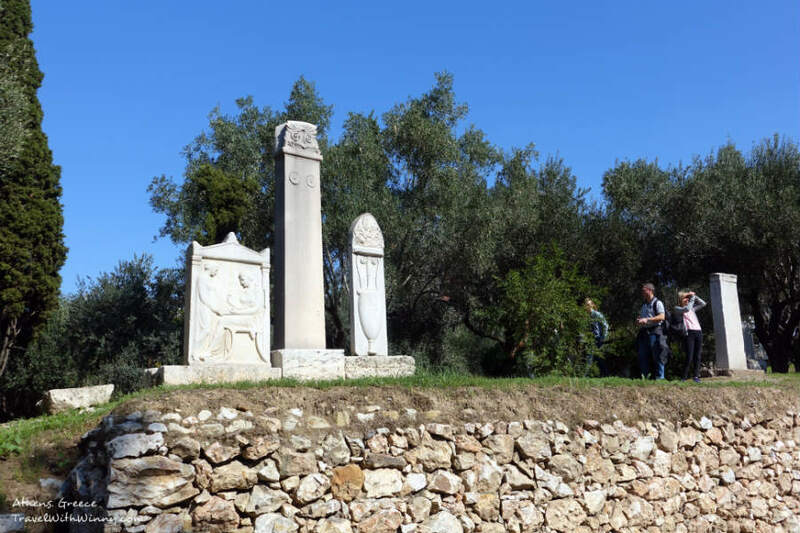 It is a free open-air gallery with clay, bronze and glasses objects from 7th to 5th century BC, as well as coins and sculptures connected with Athenian democracy. 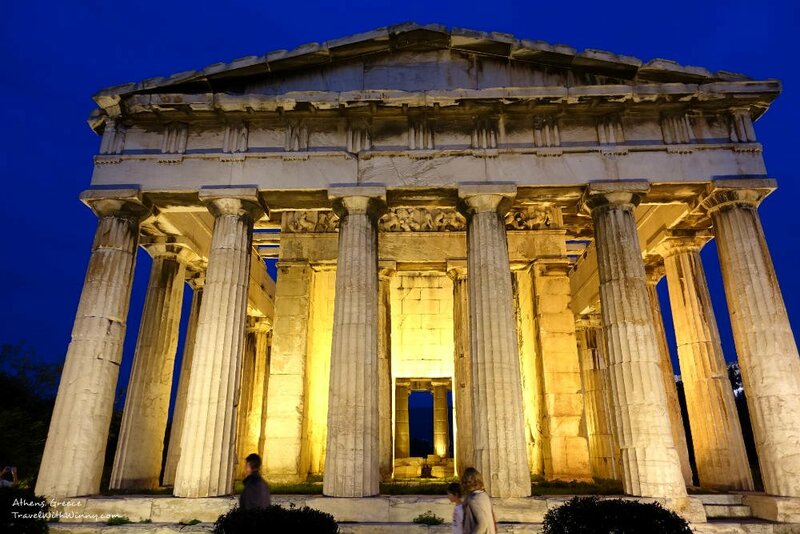 Temple of Hephaestus at night. Hadrian’s Library is north-west of Acropolis. Although largely destroyed, it was a rectangular building with an open courtyard, reading rooms and lecture halls. It was initially built-in 132AD after Emperor Hadrian. 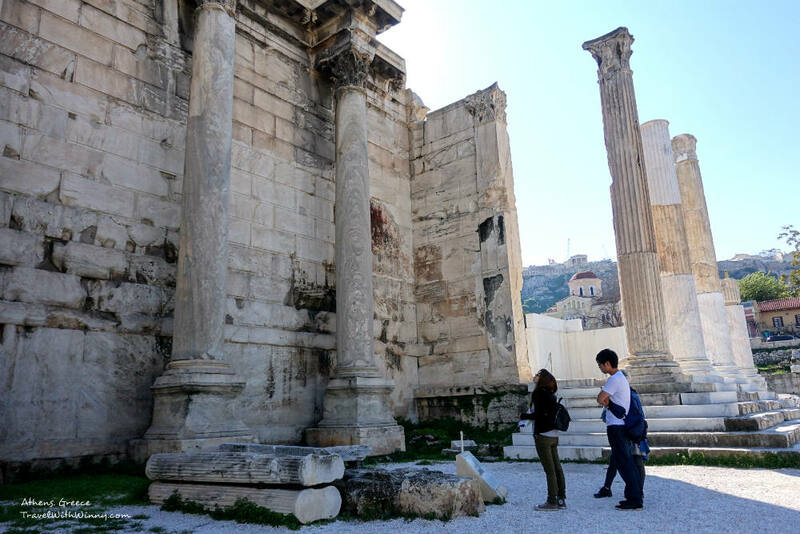 Hadrian’s Library is surrounded by modern Athenian buildings. The west walls of Hadrian’s Library was well-preserved with three churches built-in Byzantine period still standing. The west walls of Hadrian’s Library still standing strong. “Theatre of Dionisos Eleuthereos” is located on the south slope of Acropolis. 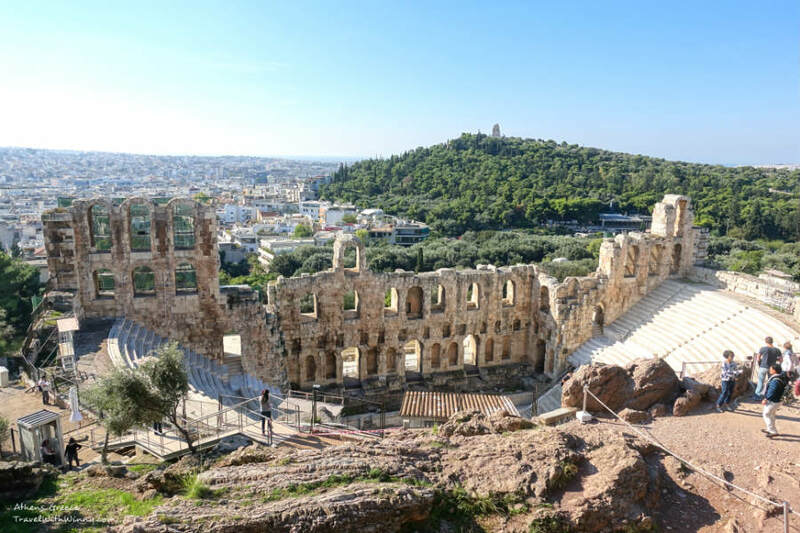 It is not to be confused with “Odeon of Herodes Atticus” which can be accessible via Dionysiou Areopagitou Street or be seen near the entrance to the Acropolis from above. “Odeon of Herodes Atticus” when viewed near the entrance of Acropolis. “Theatre of Dionisos Eleuthereos” is considered to be the first theatre in the world. It could sit 17000 spectators, however only 13 rows of the marble thrones at the central bleachers of the theatre are saved. You can sit on the restored seats and enjoy the ambience. Theatre of Dionysus Eleutherios panorama view at sunset. The Roman Agora at Athens is located to the north of the Acropolis. It is not to be confused with the Ancient Agora. It has not been completely excavated and restored. After seeing all other ruin sites, the Roman Agora was not really interesting. The entrance gate was probably the only thing worth while seeing here. The entrance to “The Roman Agora at Athens”. Located on the north-west of Athens, it is an area where the potters and vase painters of Athens were situated for production of their work. It was then used as a burial ground with earliest tomb dated back to 2700- 2000 BC. The tomb within the Kerameikos. I think these were replicas too. Although the Kerameikos site has been restored to an acceptable standard, many of the ruins on display around the area are replicas. From afar they look like ruins but you can see the difference in material when you are up closer. Most of the real ruins were probably placed inside the museum located near the Entrance. 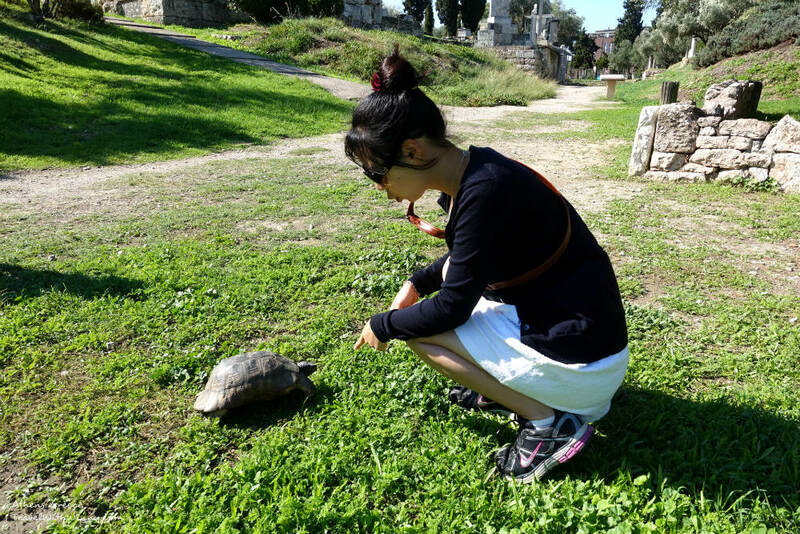 A random turtle found in Kerameikos. The museum at the entrance is called “Archaeological Museum of Kerameikos” however we didn’t go in because we were a little sick of Ruins by this point. We were somewhat more fascinated by the wild turtles roaming on the grassland. 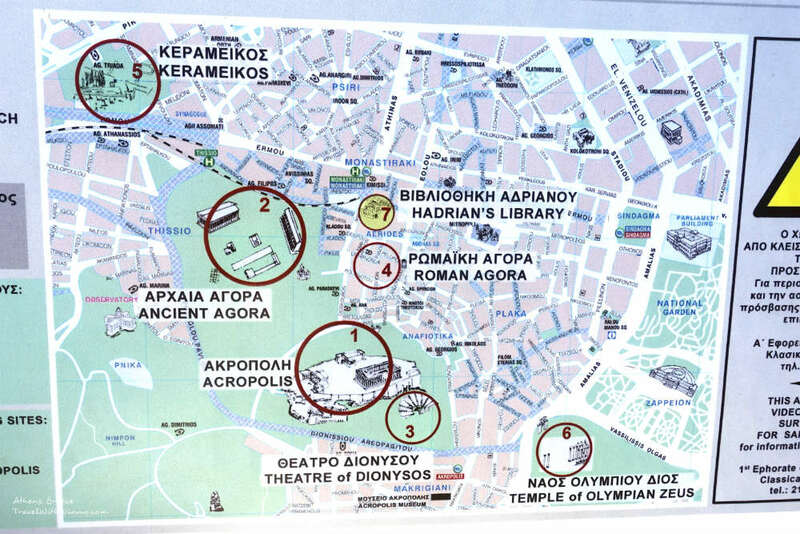 The map of the Athens ancient ruins around the area. The other sites that were included in the ticket but we didn’t go were Archaeological Museum of Kerameikos and North slope of Acropolis. The above places should keep you occupied for at least 2 days. The best type for travelling Athens on a budget is to drink tap water! Download the official “Athens Guide” APP on your smart phone by Greekguide.com. Both Android and iPhone versions available. It allows you to download to guide and view it offline so you can search for attractions and restaurants, as well as find the best value for money accommodation from Hostelbay.com and other providers, wherever you are in Greece. Acropolis at night from the roof top restaurant: Athens Status Restaurant. Stay in either Plaka, Monastiraki or Thissio districts near the Acropolis to save money on public transport. 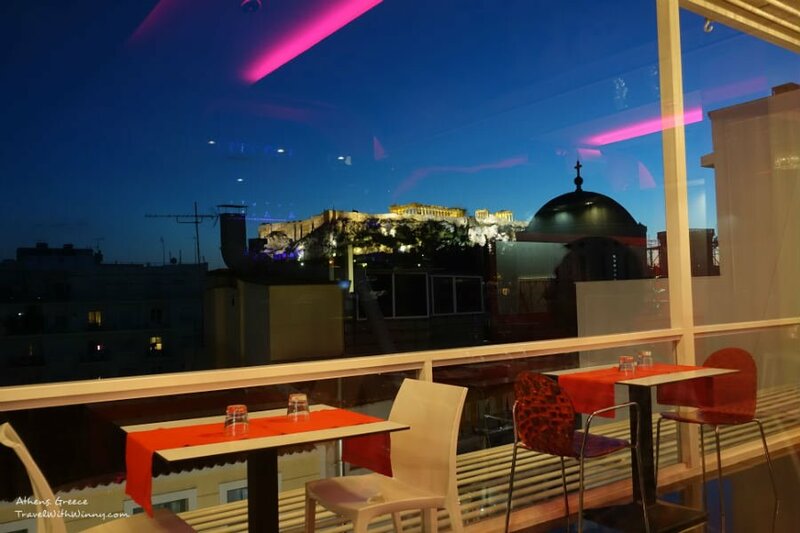 Do go to a roof-top bar or restaurant to enjoy the night view of Acropolis. A small price to pay for an amazing experience. 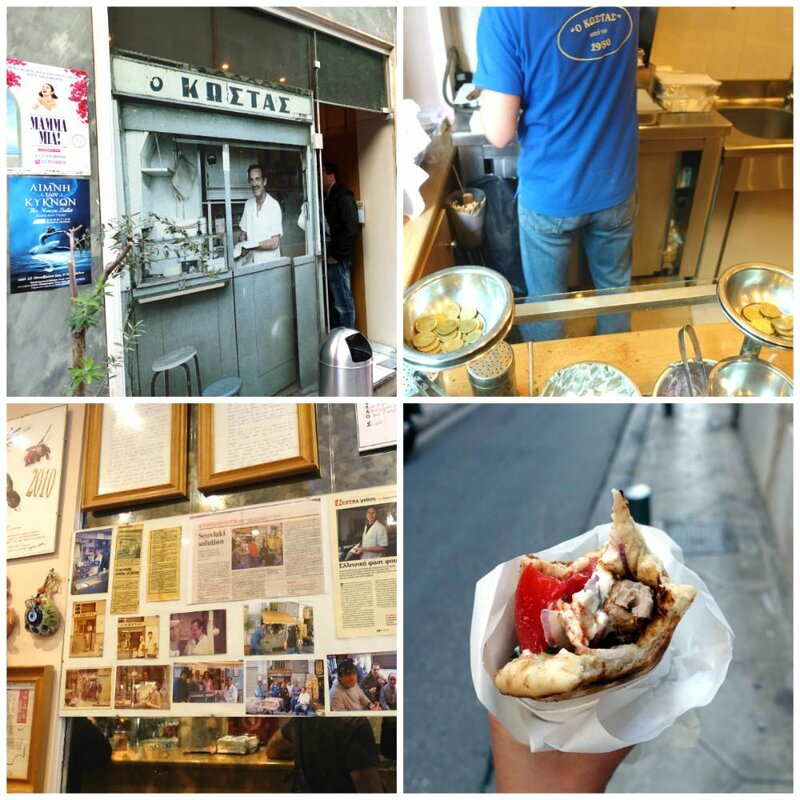 4 Steps to best gyros in Athens! The best “Athens on a budget” type of food is Souvlaki (Kebabs). One of the store I would recommend is “Kostas” in Plaka. One of the best in Athens. Each souvlaki is only €2.30. Be prepared to wait in line during lunch hours. We waited for 30 minutes just to get our hands on these. Hope you enjoyed my Athens on a budget tips!